04/03/1991 - Emergency response in the trucking industry. Title: 04/03/1991 - Emergency response in the trucking industry. This is in response to your inquiry concerning the application of 29 CFR 1910.120 and 29 CFR 1910.1200 at trucking terminals. For the sake of clarity, we are restating your questions before the answers. Question: A trucker opens the back of the truck at the trucking terminal to find a container split open with an unknown noxious chemical located on the truck bed. This person is told to go in and clean up the material. The company has no way to characterize the exposure. What level of personal protective equipment should be required and which standards apply. Each container of hazardous chemicals must be labeled, tagged or marked with the identity of the hazardous chemical, an appropriate hazard warning, and the name and address of the chemical manufacturer, importer, or other responsible party. If there is time, and based on the information on the label, the chemical manufacturer or "other responsible party" could be contacted to determine emergency control measures and to estimate "worst-case exposures." A Material Safety Data Sheet (MSDS) must accompany each initial shipment of hazardous chemical and must be readily accessible to employees handling the chemical. MSDSs are also sent with the product whenever new information on the chemical necessitates the updating of the MSDS. The Department of Transportation (DOT), however, requires information on the bill of lading for all shipments of hazardous cargo which all drivers must carry. The company could characterize the exposure by the DOT-required information from the driver's bill of lading papers. If there is no potential for an emergency, then training under HCS must include if applicable leak and spill cleanup procedures including appropriate PPE, decontamination procedures and safety precautions, and other training elements required under the HCS standard. If there is an emergency, or if a trained person capable of determining whether a situation is an emergency or has the potential to be an emergency is not available, (i.e., if "worst-case exposures" have not been estimated) then the situation needs to be treated as an emergency and the provisions of 1910.120 apply as set forth below. Prior to the commencement of emergency response procedures, an emergency response plan must be developed and implemented (1910.120(q)(1)). If the employer elects to respond himself, the company needs to have someone on hand at each shift who can provide direction with respect to safe response operations for each emergency situation (29 CFR 1910.120(q)(3)(vii)). Employees engaged in responding to spills of unknown chemicals presenting an inhalation hazard or potential inhalation hazard must wear the level of respiratory protection which will protect against the worst case possible scenario. Most of the time positive pressure self-contained breathing apparatus will be initially required until such time monitoring data indicates otherwise (see 29 CFR 1910.120(q)(3)(iv)). The training under 29 CFR 1910.120(q)(6) depends on the duties and functions to be performed by the truck driver. If the truck driver is expected to stop dangerous leaks and clean up the spills then the training at the hazardous materials technician or hazardous materials specialist level is appropriate. Question: Does a freight company have the responsibility of training its employees to be ready to clean up or to respond to an emergency caused by the opening of a package or container improperly labelled by a customer? Answer: If a freight company has the potential for receiving hazardous substances in a form, amount, or manner that has a potential for causing an emergency situation then the company falls under the scope of 29 CFR 1910.120(q). The employer can elect to evacuate their employees from the danger area when an emergency occurs and have an emergency action plan in accordance with 29 CFR 1910.38(a) (see 1910.120(q)(1)). If the employer takes a response role then an emergency response plan must be developed. This plan must address, among other elements, personnel roles, lines of authority, training, and communication. The employer has several options on the structure of the emergency response organization. For example, the employer could train all receivers at the first responder awareness level and have a response team that would be called in to respond to emergencies. The receivers could also be trained under the HCS to clean up minor spills and leaks. 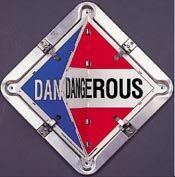 We've got your DOT number at Safety Emporium with DOT placards, NFPA labels and more! Question: If 1910.1200(h) is cited for training, it requires retraining "whenever a new hazard is introduced into their work area". This could be a daily event in a trucking terminal. Is there a point at which we should require these companies train under both 1910.120 and 1910.1200? How strict should we interpret this requirement?